Even after harder 1st half, Belgium eventually found a way through Panama’s organized and deep defensive structure, which in the end became a really dominant performance for Martinez’s side. Belgium started in their expected formation, with Boyata taking the position of the injured Kompany as the central-defender of the 3-defender system. Panama started with a 4-1-4-1, which turned out to be a strategically and tactically good choice, as with an extra-man in midfield in front of the centre-backs, they had a better control on Hazard’s and Mertens’ movements in between the lines, especially closing down Hazard in most cases. Panama immediately dropped deeper into a low-block, in a 4-1-4-1-0/4-1-5-0 staggering, therefore they could control Belgium’s occupation of the central spaces, with the central-midfielders basically closing down De Bruyne-Witsel, leaving Vertonghen-Boyata-Alderweireld open. 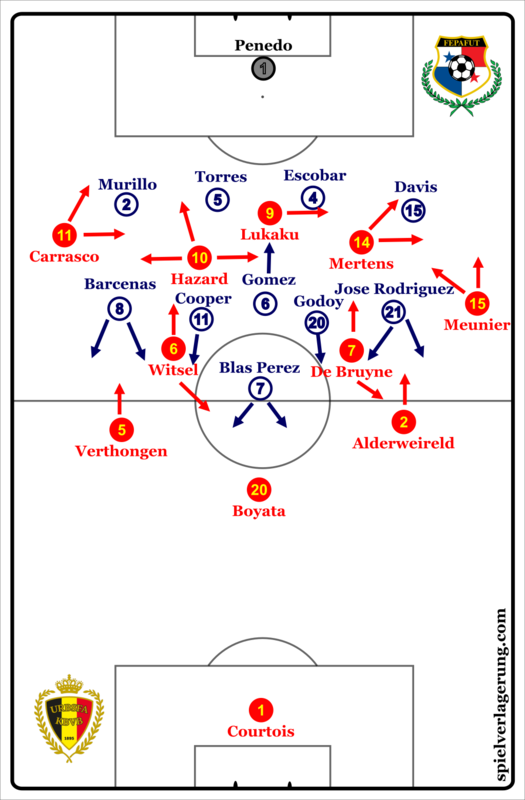 In possession Belgium formed a 3-2-2-3 with their staggering, in where both Hazard and Mertens moved basically deeper, closer to Panama’s second-line, in order to have a better manipulation on them & reduce the oppositional cover with separating themselves from the oppositional last line. 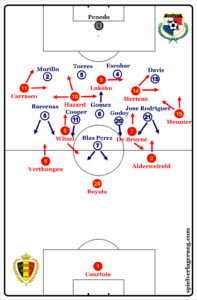 As their previous games showed Belgium generally put a bigger emphasis on building through their right side, using even Hazard to create numerical superiorities, overloads in order to progress through the oppositional second-line. Thus they have better dynamics on their right side, where Meunier is able to stretch the oppositional second-line to open up space for Hazard-Mertens, or for Alderweireld to drive forward on the ball. With Meunier manipulating the oppositional winger into a wider defensive positioning, Alderweireld was being closed-down by the left central-midfielder, who was generally covering De Bruyne-Witsel, therefore at first he had to cover them, then close down Alderweireld, which in fact increased his time for the on the ball actions. Whilst they had serious issues on the left side, where Carrasco often left alone, therefore Panama’s right-back –Murillo-, could easily close him down, preventing him to turn towards the goal, or using his diagonal dribbling to cut inside or open up diagonal passing lanes. Carrasco’s isolation on the left was also a result of Hazard’s movement in between the lines, where he much rather occupied the central spaces, leaving Carrasco alone. Occasionally Hazard moved out to the left, switching position with Carrasco, which created a better dynamics on the left, although basically Hazard occupied the central spaces or even the right halfspaces, to take part in Belgium’s right-sided dynamics. Panama’s basic defensive structure & movements – on the ball-near side the central-midfielder is able to close down the sidebacks, whilst the CF drops deeper to close down the ball-near CM/De Bruyne. Also at the beginning without Belgium circulating properly the defensive-midfielder could also make ball-oriented movements to offer defensive depth in between the lines on the ball-near side. 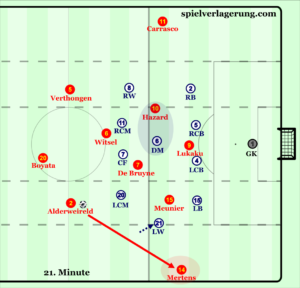 Without Belgium being able to effectively circulate the ball at Panama’s half, their defensive structure was able to handle Hazard’s and Mertens’ movements and runs from depth in between the lines, with the defensive-midfielder providing optimal local compactness, and support in these areas. With Panama’s full-backs often pushing higher up to close down Belgium’s wing-backs Hazard and Mertens were trying to attacks these spaces behind, although not only the defensive-midfielder, but the ball-near centre-back moved out well to cover the space behind the full-back, who pushed higher up. This may although create some strategical disadvantages, which I will elaborate later. Trapping/closing down Hazard on the right – with the DM’s heavily Hazard-oriented movement he was able to neutralize him in between the lines. A situation which shows Belgium’s issues at the left due to inadequate spacing & staggering and circulation problems. 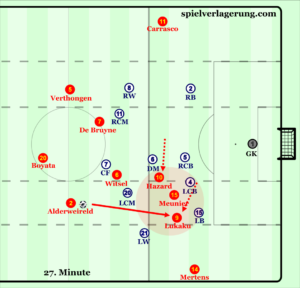 Therefore the key for Belgium was to be able to circulate the ball, whilst not providing time for Panama’s defensive-midfielder to make ball-oriented movements in between the lines, to open spaces and gaps for the wingers, or even De Bruyne behind the second line. Reacting to this at first De Bruyne and Witsel started to drop deeper, to take over the control of the circulation from the sidebacks, trying to manipulate the second line, with pulling the central-midfielders out and open up passing lanes behind them. With Panama only using 1 centre-forward –who did also drop into a very deep position- it allowed more time for on the ball actions for De Bruyne, creating possible opportunities for his through balls behind the defensive structure. Although he often took too much risk too early -20 inaccurate passes in overall-, even with occasionally finding passing lanes in between the lines with diagonal passes. 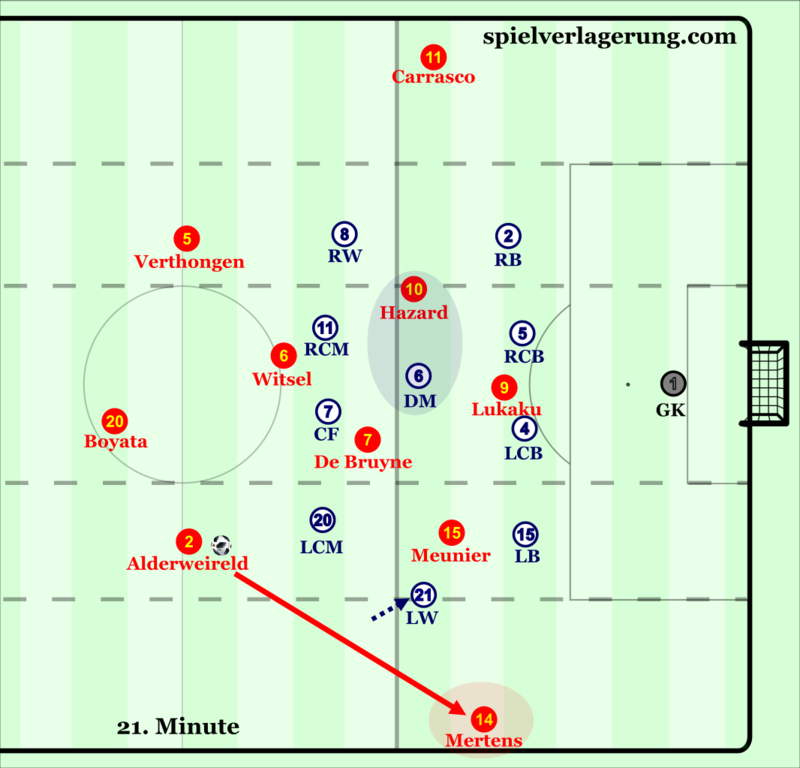 Whilst this movement created better on the ball actions for the central-midfielders, it also meant Belgium lost depth, which was problematic, since Panama left the 3 centre backs open, therefore dropping 2 more players wasn’t necessary to have a proper structure and movements to manipulate the oppositional second line. Therefore later De Bruyne and Witsel moved up higher, with De Bruyne moving up in between the lines, creating a 3-1-5-1/3-1-3-3-ish staggering, offering more depth in between the lines. 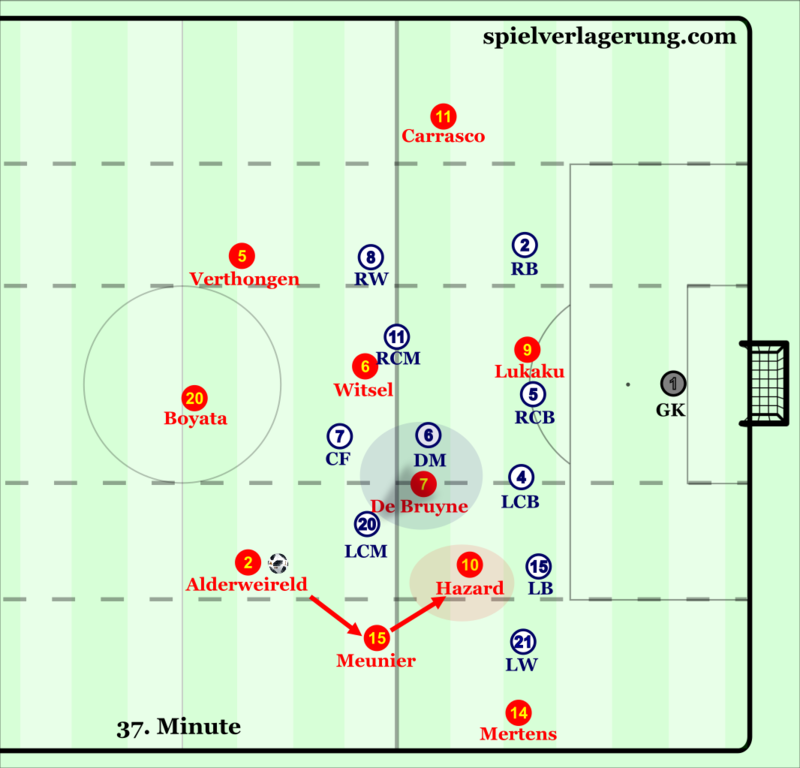 From this positioning better circulation and penetration patterns emerged, as Panama’s CF dropping into a deep position even opened up the direct passing lane between the sidebacks, therefore Belgium was able to speed up their circulation, not allowing enough time for Panama’s DM to make his ball-oriented movements, opening up space for the movements in between the lines, eventually finding spaces in between the lines, getting behind Panama’s second line more and more. Besides, with De Bruyne’s higher positioning the oppositional DM was forced into a decisional-crisis –whom to cover-, which resulted him marking Hazard at the centre, which opened up a bit of space for De Bruyne-Mertens leading to a more functional right sided dynamics. Creating more depth also forced the oppositional LW into a crisis: if he position himself wider to cover Meunier, it opens up space on the inside, while on the other hand if he is covering the inside lane it opens up the direct access to Meunier-Mertens wide, getting behind the second line from the outside. Solution 1 – exploiting shifting issues at the left side, manipulating oppositional winger. With Meunier-Mertens switching position Meunier could drag the oppositional forward with himself, opening up the direct passing lane towards Mertens, progressing through the second line. Solution 2 – bigger involvement of Lukaku. With Lukaku moving towards the halfspaces more Belgium was able to create overloads at the right side. From here on much better circulations prevented the oppositional DM to make the ball-oriented movements, which created even more spaces in between the lines. Meunier-Mertens switching position again, Hazard to make his usual movement towards the right. Solution 3 – with De Bruyne moving up higher he divided the attention of the oppositional DM, creating a free-man/Hazard in between the lines. This also forced the oppositional LCM to use his cover shadow to close down De Bruyne, creating a bigger gap between him and the LW, opening up space for Meunier here. With Meunier-Mertens switching, plus overloading the right side, it also forced the oppositional LW to drop even more -closing down the direct lane towards Mertens-, opening up space and passing lane in this zone. From their ultra-defensive approach Panama wasn’t really able to create stable possession spells throughout the whole – not counting the last minutes, with being 3-0 down-, only after collecting second-balls from their long goal kicks. 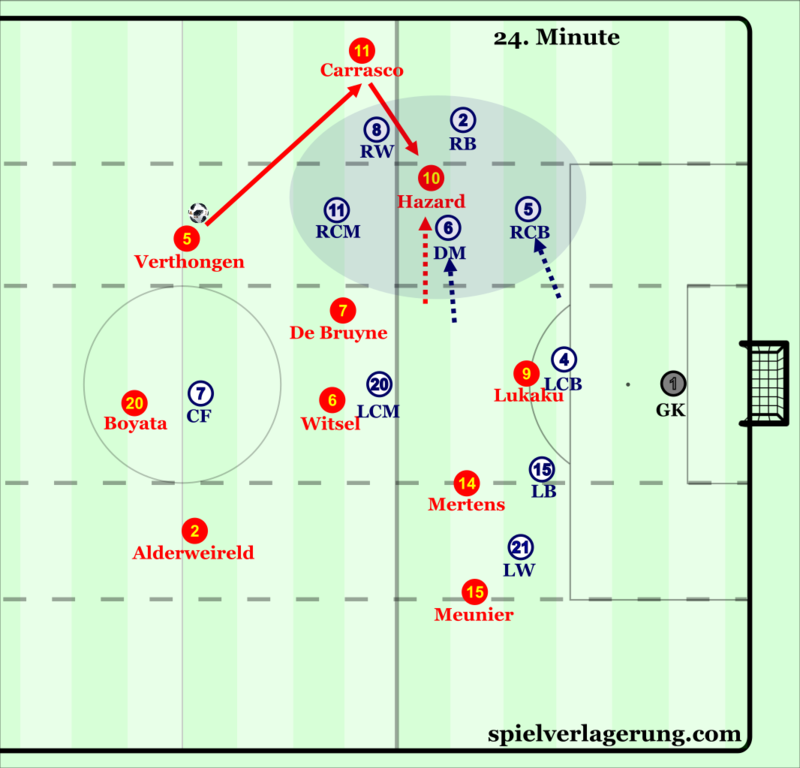 With Belgium’s first line being positioned higher Panama had a numerical advantage at the centre -3v2 against De Bruyne-Witsel-, from where they were able to collect the second-balls, but still even with having control on the ball, they tended to immediately look for long options towards the CF or the ball-far winger. At some cases of building through the CBs, several issues arose: without being properly staggered they couldn’t progress through exploiting the numerical advantage at the centre –just in some cases-, lacking the adequate central presence. 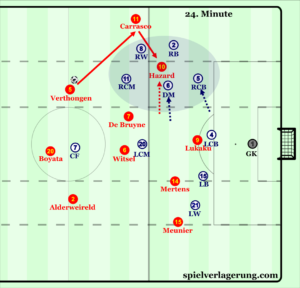 With using long passes they were trying to exploit Belgium’s lack of vertical compactness, with the 2 CMs often being far from the 3 centre-backs at the centre, which created a better access for Panama to collect the second balls. Reacting to this, Belgium’s first-line started to drop deeper, even Lukaku, with him dropping deeper onto Panama’s DM, therefore being able to force backwards passes, then pushing higher up applying this as a pressing trigger. In some cases Panama’s DM even dropped in between the CBs, and with the CMs being positioned very high, the full-backs very being immediately forced to kick it long. Although with having both the full-back and winger wide, they were able to create shifting problems for Belgium’s last line, especially at the left side, where Meunier could be held in position, forcing Mertens into a wider defending. On the other side though Carrasco pushed higher up with a very good timing, and even with leaving the passing lane open towards the oppositional winger, Vertonghen’s adequate adjustment and shift allowed to basically trap Panama’s possession at the left side. 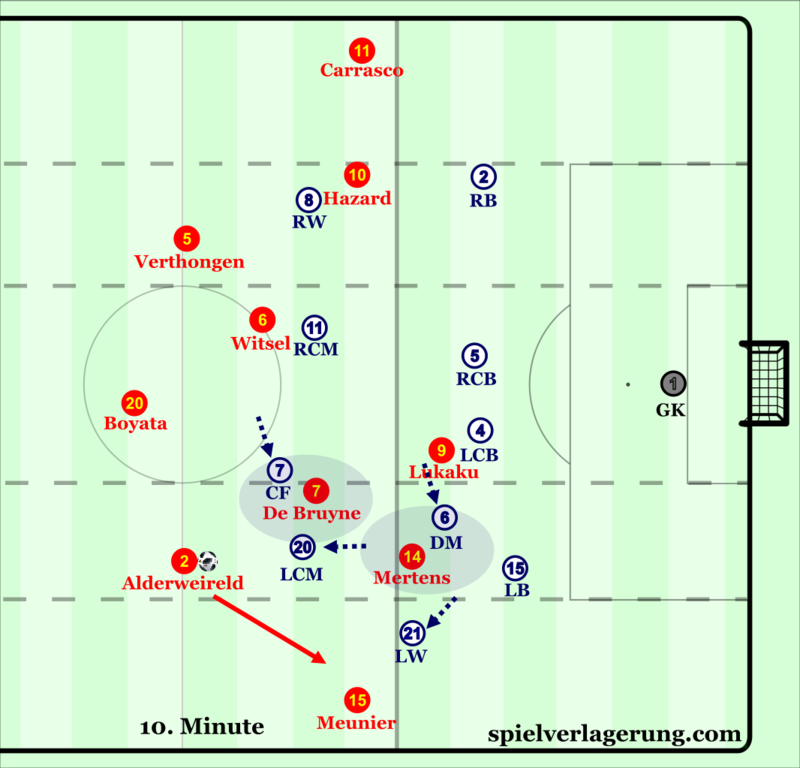 Even with opening up time for the full-backs on the left –exploiting Meunier’s defending-, Panama was still being forced to long balls, because of their staggering and lack of central presence. With De Bruyne positioning himself higher, it created more penetration options and opportunities, at the end of the first half, therefore he continued to operate in between the lines, to divide the attention of the oppositional defensive-midfielder with Mertens and Hazard, and also forcing a central-midfielder deeper opening up space for Witsel-Alderweireld on the ball –better opportunities for the latter to play diagonal long balls towards Carrasco. Even the first goal came from this, with De Bruyne being able to receive in between the lines, from where he had better access towards Mertens and Hazard to progress the penetration further. Also, Lukaku’s involvement got a higher emphasis in the second half, with him moving towards the right halfspaces more often to offer a diagonal option. This movement left the oppositional centre-backs in crisis, as if he follows Lukaku too far, then it leaves too much space behind that could be exploited with Lukaku’s lay-off patterns toward the wingers, therefore Lukaku could offer an extra option at the right side, with even forcing a late press on him. Since De Bruyne, Lukaku and Meunier improved the right-sided dynamics well, Hazard moved out towards the left more often, switching positions with Carrasco, creating possible 1v1 situations for himself next to the sidelines. A more stable left sided occupation from Hazard meant a better left-sided dynamics also, supporting the wide player with deep runs from the halfspaces behind the oppositional full-back. At this phase, Panama got themselves into trouble: with even dropping the centre-forward deep, it left the 3 Belgian centre-backs open, leading to more and more long possession spells from them, completely taking control of the game. 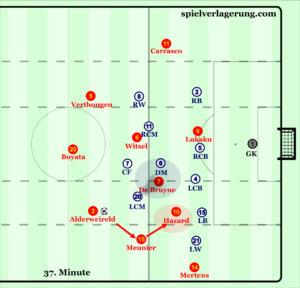 If they decided to push up higher –also with Belgium inviting them to press- Belgium’s well spaced and staggered central occupation always offered a way through the more aggressive defending, as if the central-midfielders decided to move up and press Alderweireld-Vertonghen it opened up the passing lane to Witsel-De Bruyne in behind. 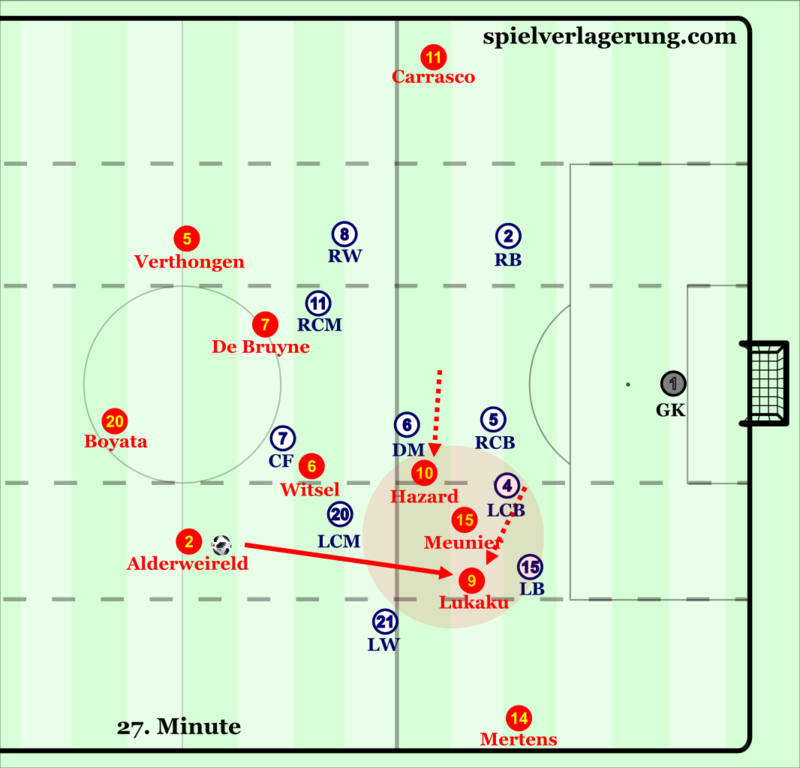 This takes us to the second-goal, where Belgium was able to stretch Panama’s second line with De Bruyne being deeper on the left, and with Hazard’s deep run they were also able to pull out the ball-near centre-back from position: this meant less cover inside the box, especially from a strategic point of view, with losing a possible key player at aerial duel situations. Also, with Lukaku making his usual inside the box movement to position himself between the ball-far centre-back and full-back, he created a shifting problem, where it was the full-back who marked him. Needless to say, what advantages it have, especially taking Lukaku’s physical attributes into account. Especially after the second goal –after the first as well, but for a shorter period- Panama lost it’s organization completely at all phases, leading to even more penetration from Belgium, finding the 3rd goal after a brilliant counter attack between Hazard and Lukaku. Besides Martinez made an interesting substitution, with bringing on Dembele for Carrasco, leading to a little structural change. In possession the 3-2-2-3 staggering didn’t change – with Dembele moving higher up at the left halfspace, Hazard keeping width-, although out of possession they switched to a narrow 4-3-3 defending, with the first line still being higher up – a huge advantage at counter-attacks. With the first line being constantly higher up, they could offer as an immediate option the exploit the space behind the full-backs, especially at less structured phases –after goal kicks. With Hazard often attacking the Panama’s right centre-back he occupied a higher position, so he was able to receive immediately and creating dribbling opportunities against a centre-back. These movements were more specific when defending higher, whilst counter attacking from deeper defending created a different dynamics. In that cases Hazard receiving deeper led to duels against oppositional central-midfielders with also having even more space in front to dribble into, just as it happened before the 3rd goal. Their set plays were also very interesting, using mostly short corner variations in the beginning, exploiting Panama’s issue at defending them. With having fast corners they were able to divide Panama’s attention, since the man-markers were still focusing on the possible opponents rather than appropriately close down the short corner variations, which created 3v2 situations, and several shot opportunities. 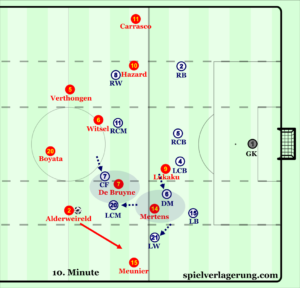 Panama’s approach was functioning really well at the beginning of the game, although with adequate in-game changes Belgium was able to find their way through the very deep low block. This might be key to beat Tunisia in the next round, who also imply a deeper 4-1-4-1 in defending, but it looks like they might already have the recipe for that.